God cautions us that when riches increase, do not set your heart on them. It is interesting to know that the only reason why some people still come to church is because they do not have money. The only reason why some people still serve God is because they don’t have jobs yet. The day they get the job is the day they get too busy for God. The day they land that great business deal is the day they stop to pray. 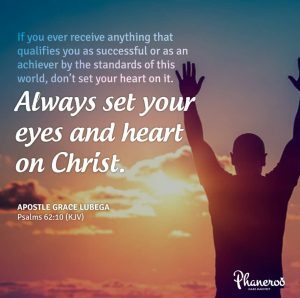 If you ever receive anything that qualifies you as successful or as an achiever by the standards of this world, do not set your heart on it. In fact, the very reason why you ought to seek God more is because He has added more blessings to your life. Like the disciples, when you see the greatest catch of fish in your lifetime, consider it an opportunity to prove to the world that what is in God is greater than any riches in this life. Beloved saint, wealth is coming your way and God has purposed to increase your greatness on every side but you ought to make the decision not to set your heart on these material things. Always set your eyes and heart on Christ. Hallelujah! If you ever receive anything that qualifies you as successful or as an achiever by the standards of this world, don’t set your heart on it. Always set your eyes and heart on Christ. PRAYER: My God, I thank You for Your Word. I have the tenacity and ability to handle the multiplication of blessings in my life. I can never be set off the course of my life by riches and material things. I understand that they are a tool for the gospel. In this wisdom, I walk in the mastery of greatness. To the glory of Your name. Amen.